Today we take it for granted that DNA, present as a single chromosome or one of several chromosomes in the cell, is the genetic material that encodes all the information required to “build” an organism. But it was once a very controversial idea. Cells are incredibly complex collections of biological macromolecules that carry out diverse biological reactions, while DNA is an extremely simple molecule comprised of only 4 nucleotide bases. How could something so simple contain all the information required to build a cell? Part 1: The classic experimental evidence that DNA encodes genetic information. Frederick Griffith worked with two strains of Streptococcus pneumoniae. The S strain produced a polysaccharide capsule and formed smooth-looking colonies. The R strain could not produce the polysaccharide capsule and formed rough-looking colonies. The S strain was virulent and killed mice. The R strain was non-virulent when injected into mice. Griffith reported in 1928 that mixtures of heat-killed extracts of the S cells plus live R cells killed mice, although neither injected alone were virulent. Autopsies of the dead mice showed bacterial cells in the blood. When cultured, these formed smooth colonies. He concluded that something from the extract of heat-killed S cells had transformed some of the R cells into S cells. Oswald Avery, Colin McLeod and Maclyn McCarty painstaking purified the transforming substance identified by Griffith and reported in their 1944 paper that it was DNA. Their purification procedure eliminated polysaccharides, and they found that the transforming substance was unaffected by proteases or ribonuclease (enzymes that cleave proteins and RNAs), but was destroyed by deoxyribonuclease. Thus they concluded that transforming substance had to be DNA. Left: bacteriophage proteins are labeled with 35S; right: phage DNA is labeled with 32P. Labeled phage were incubated briefly with cells to allow attachment and injection of genetic material into the cells. A bar blender was used to shear off the attached phage shells from the cells. Centrifugation pelleted the cells, leaving the phage shells suspended in the supernatant fraction. Radioactive phosphorus pelleted with the cells, but radioactive sulfur remained in the supernatant. Image from wikipedia, by Thomasione, with GFDL or CC-BY-SA license. Watson and Crick used Rosalind Franklin’s X-ray diffraction data on purified DNA to deduce that DNA has a helical structure. They were able to solve the structure of DNA when they realized that the molecule was a duplex consisting of two anti-parallel strands, with the sugar-phosphate backbone was on the outside, and the bases paired on the inside with hydrogen bonds between A and T, or between C and G, accounting for Chargaff’s rules. The directionality of a strand of DNA (or RNA) can be seen in the sugar-phosphate backbone. One end has a 5′ carbon with a phosphate attached; the other end has a 3′ carbon with a hydroxyl (-OH) group attached. We indicate directionality as 5′ –> 3′. The two strands of DNA are not only complementary to each other (where one strand has an A, the complementary strand has a T and where one strand has a C, the complementary strand has a G, and so forth), but run in opposite directions: 5′–>3′ and 3′ <– 5′. The structure of DNA, consisting of two complementary strands, suggests that DNA could replicate by unzipping into two separate strands, and each strand would serve as the template for the synthesis of its complementary partner strand. This is called semi-conservative replication, because each resulting daughter DNA molecule would consist of one original (parental) strand and one newly synthesized strand. Other possible modes would be conservative replication, and dispersive replication. Matthew Meselson and Franklin Stahl used a density isotope of nitrogen, 15N, to label DNA and density-gradient ultracentrifugation to analyze 15N density-labeled DNA (heavy DNA) before and after rounds of replication in medium contain normal 14N (light nitrogen). The semi-conservative model predicted that, in this experiment, the daughter DNA molecules after one round of DNA replication would all consist of one 15N-labeled DNA strand and one 14N-labeled DNA strand, and therefore would have intermediate density. That was exactly the result observed. Students should work through the results predicted by conservative and dispersive modes of replication, and explain how the observed results disprove these alternative hypotheses. Replication of chromosomal DNA begins at special sites called origins of replication, where the DNA duplex is unzipped. Origins of replication tend to be full of A-T base pairs rather than G-C. What property of A-T pairing vs G-C pairing could explain this observation? DNA replication proceeds bidirectionally from the origin, with the enzyme helicase at the replication “fork” unzipping and unwinding the DNA template in both directions away from the origin. DNA polymerase requires an RNA primer, synthesized by primase, to begin polymerizing DNA. 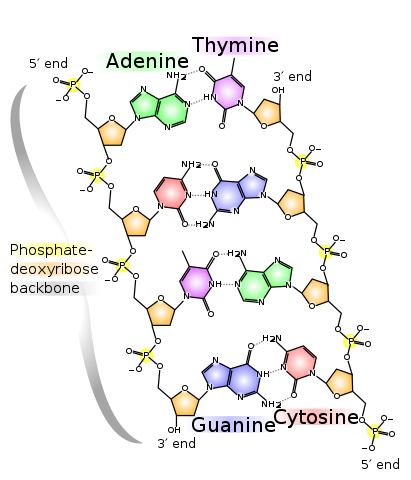 DNA polymerase has to have an existing 3′-OH to add to, so it cannot start synthesizing a complementary strand from scratch. But RNA polymerase can start from scratch, so a new DNA strand starts with an RNA primer which is synthesized by primase. DNA polymerase then starts by adding on to the 3′-OH end of the RNA primer. DNA polymerase adds new nucleotides only at the 3′-OH end, so new strands grow 5′ –> 3′. DNA polymerase reads the template strand 3′ –> 5′, so the new DNA duplex is antiparallel. One daughter strand, called the “leading” strand, can be synthesized continuously, in the same direction that the DNA is being unzipped at the fork. The other daughter strand, the “lagging” strand, has to be synthesized in short fragments, called “Okazaki” fragments, that start with an RNA primer and are synthesized going away from the fork. The Okazaki fragments are sealed by an enzyme called DNA ligase. As the replication fork extends in one direction above, the leading strand (top strand) can be synthesized continuously because it is proceeding in the 5′ to 3′ direction. The lagging strand must be synthesized in short fragments as the DNA fork extends. This is because DNA synthesis must ALWAYS proceed in the 5′ to 3′ direction (adding the 5′ phosphate end of a new nucleotide to the 3′ hydroxyl group of the last nucleotide in the existing chain), but the lagging strand template is running the ‘wrong’ way for synthesis to occur in the direction of the replication fork. Note both strands require RNA primers (red) to begin DNA synthesis. Written by: Jung Choi on November 10, 2012. Last revised by: shanakerrJune 19, 2018. I believe Hank Green’s mistake was that he circled the 5′ end every time. Yes, he circles the 5′ end and calls it the 5′ end the first time, then he circles the 5′ carbon on the next nucleotide and calls it the 3′ – about 3:14 into the video. Is there a reason for having the two DNA strands anti-parallel? Is it advantageous in any way? I believe the base-pairing (hydrogen bonds) doesn’t work if the two strands are parallel. The two strands have to be antiparallel for the bases to be in the right orientation to form the hydrogen bonds. Shouldn’t this say “lagging strand”? Thanks for catching that. Fixed with a strikethrough of “leading” and insertion of “lagging”.